Ramen Noodle Salad is a potluck favorite! 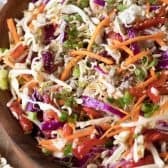 Crisp cabbage, bean sprouts, shredded carrots and ramen noodles are tossed together for the perfect Oriental salad that everyone always loves! In a large bowl, add green & purple cabbage, carrots, bean sprouts, red pepper & green onions. Break up the ramen noodles and add them (uncooked) to the cabbage mixture. In a separate bowl, whisk together all dressing ingredients. Pour over ramen mixture and toss to combine. Top with sesame seeds and refrigerate at least 2 hours before serving. I use chicken flavored ramen noodles, but you can use any flavor you like.